Employers with at least 20 persons performing work for compensation (or at least 50 persons, in the case of a nonprofit organization) and that have at least one employee who performs work in San Francisco are subject to the San Francisco Health Care Security Ordinance (HCSO). 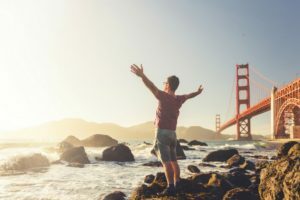 Generally, that law requires the employers to make contributions toward their San Francisco employees’ healthcare coverage for each hour the employees work in San Francisco (unless the employees are substantially part time). $2.83 per hour for large businesses (100 or more employees total, not just in San Francisco). $1.89 per hour for medium-sized businesses (20-99 employees total). In years past, a self-insured healthcare plan sponsor could satisfy the current year’s healthcare expenditure obligation if its average hourly expenditure rate (under the self-insured plan) per employee for the preceding year met or exceeded the hourly expenditure rate for the current year. For administrative convenience, the sponsor was permitted to calculate its average hourly expenditure rate for the current year by dividing the current monthly COBRA rate for the self-insured plan (minus the two-percent administrative fee) by 172. Because Health Care Expenditures must all be made irrevocably for 2017 and future years, amounts that are not irrevocably spent cannot be considered in determining whether a self-funded plan complies with the HCSO. The COBRA-equivalent rate for a health care plan may not be used to determine whether a Covered Employer has satisfied the spending requirement of the HCSO; Health Care Expenditures must reflect amounts irrevocably paid to third parties. The City says, in a January 9 update to its FAQs regarding the HCSO, that it will enforce the new interpretation for 2018 and later years. Self-funded employers may wait until the end of a calendar year to determine whether, under a uniform self-funded plan, their average actual healthcare expenditures for HCSO-covered employees under the plan for the year were adequate to satisfy the minimum contribution requirement. If not, the self-funded employer has until the end of February in the new year to true things up for these employees. Employers can avoid making an HCSO expenditure for an employee if the employee voluntarily waives his or her rights, in writing, to that expenditure. This is often the case where the employee has health insurance coverage through a spouse, parent or domestic partner. For 2018 there is a new Employee Voluntary Waiver Form. The form may be provided and signed electronically. See Q&A 11 here. The HCSO requires covered employers to post a notice about the HCSO at all workplace or job sites. The notice has been updated for 2018. The new notice is here. For more information about the HCSO, please contact your Lockton account service team.